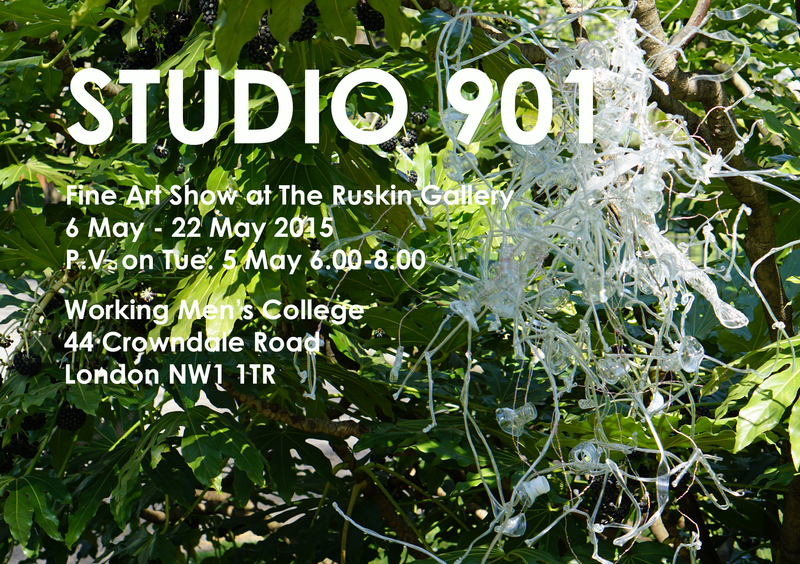 The exhibition ‘Studio 901’ showcases the work of 14 Fine Artists who come together every Tuesday at Working Men’s College in studio 901 to work on projects, take part in workshops, and share ideas. The Fine Art course is for artists at all stages in their creative practice whether they are beginners who are just starting out, or experienced artists with degrees and years of experience behind them. What unites the group is a genuine curiosity about contemporary art and a need to talk to and bounce off ideas with like-minded people. The art work in the show is the result of one, and in some cases two term’s work. Some of it has been made in response to themed workshops and group discussions on notions and experiences of ‘Time’, and also ‘Chromophilia’, the obsessive passion for colour. Other work has been independently generated where artists have pursued their own line of inquiry and experimentation. Altogether, the variety of the work on display makes for a very lively exhibition, which is a true reflection of what goes on in Studio 901.